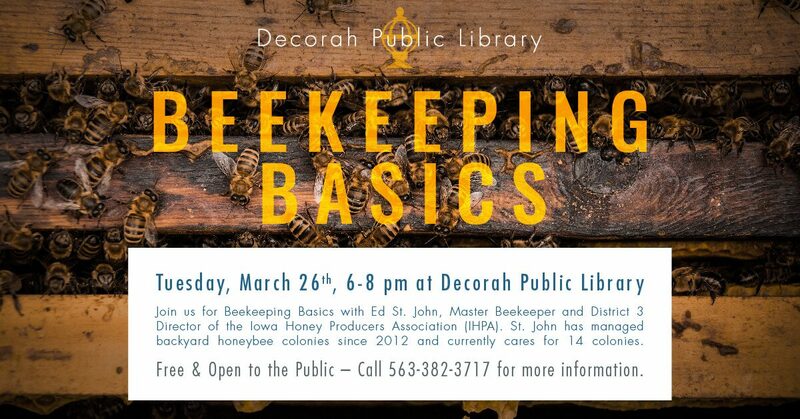 On Tuesday, March 26 from 6 to 8 p.m., join the Decorah Public Library in welcoming Master Beekeeper Ed St. John, District 3 Director of the Iowa Honey Producers Association (IHPA), for an overview on beekeeping in Iowa. St. John has managed backyard honeybee colonies since 2012 and currently cares for 14 colonies. Part of the IHPA’s mission is to educate the public about beekeeping and to promote the advancement of the beekeeping industry. Honeybees pollinate 80% of the United States’ flowering crops which constitute one third of everything we eat. St. John’s presentation will take place in the Mezzanine of the Decorah Public Library. For further information, contact Carmen Buss at the library 382-3717.